I stumbled across the address autocomplete feature in one of my most recent CRM Online trials. When I set up the trial I was able to choose some of the newer add-ons like Field Service and Project Service. I learned from other online blogs that the postal address autocomplete feature is added as part of the Field Service solution. Microsoft recommends that you get the trial here and then you can purchase it once you’ve tried it out. The basic idea is that it tries to fill in the address once you’ve provided some part of it. For example, after you fill in the street address, it will try to autocomplete the rest of the address by providing potential options. Then you can select the one that’s correct or ignore it and fill in the address yourself. The second feature that I wanted to highlight was the addition of self-service portals for non-CRM users. Portals allow your customers to view CRM data, submit support requests, interact on your website forums, among so many other cool features. It can also be helpful if you have a sales team that needs some access to CRM data but not enough to warrant a CRM user license. Portals are an add-on feature to CRM Online but you can request a trial from here. All you have to do is provide some contact information and business justification and they’ll send you a trial key. I received mine very quickly and I can’t wait to try it out! The first feature I’m going to review is the ability to create and restore backups on your own. Previously you would have had to involve Microsoft to obtain a backup of your CRM organization. Now you can create a backup on demand, although backups are still performed daily, and you can restore a backup at your leisure. You can manage your backups in the CRM Online Admin Center which you can get to from the Office 365 Admin Center. You can only restore on-demand backups to a sandbox instance. Check out this TechNet article for full details. ZOHO CRM 2016 – Change is good! Have you had the courage yet to try Zoho CRM 2016? It can be disorienting sometimes getting used to a new user interface, especially if you’ve been using the application for a while, but I’m telling you it’s really worth it! Every day with the new system I’m finding little things that make using Zoho even easier to use. Favoriting Reports – Now you can click a little star next a report name and it will pin the report to the top of the report list so it’s easier to find! Template Versioning Notes – When you update a template, you now have the option to include notes of what updates you made. Applying Discounts – you can now right click the arrow next to line item discounts and either enter a flat percentage, a flat amount or select a pricebook. Switch over today and let us know what cool new features you find! ZOHO CRM – Where are all my custom buttons? NOW, they are together in a drop down list with ONLY the name of the first button showing. ZOHO CRM – Version 2016 – Where is the record history? This area received a really nice make-over! When viewing a record, you can now access this information in the new left nav panel, by clicking Timeline. At this point, we’ll now jump to the process builder to finalize our process. There’s a lot in here and we’re only doing a brief process. As you work with this part of the system you’ll inevitably discover more and more things that you can do with the new builder. Go to Setup and search for “Process Builder”. Click the resulting link and you’ll be brought to the builder itself (which in a way seems very separate from Salesforce but it’s more like diving deep into the platform). Once it loads, you’ll see some existing processes (2 of which are just samples). You want to click New on the right hand side of the page. Once saved, you’ll now get the “flow chart” designer that allows you to define the process including the object it’s working on (triggered by), the criteria and the actions. Click “Add object” to choose which object this is triggered upon. Here we will chose the “Order” object (this object is fairly new and also has to be enabled – maybe a future tip on the orders….). 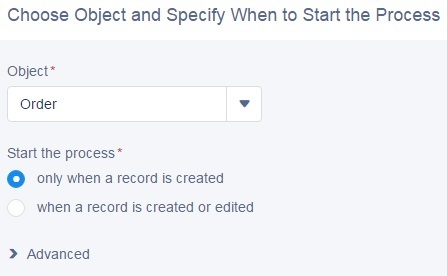 After clicking next, you can now select the criteria and set the criteria. In this case, we’ve chosen the criteria to be when an order equals draft. What I personally like is that you have the ability to have multiples like “Is Changed” and now “Equals” to actually create a “Changes to….” scenario. 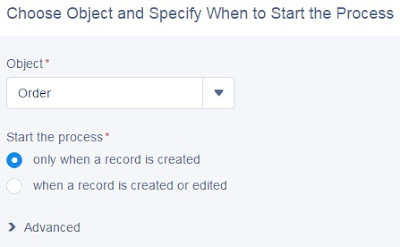 Finally, add in the action or select the action of what happens when the criteria is met. Here it is an “Email Alert” where we’ll chose the alert made in our previous tip. Be sure to join our webinar this coming month (or see our Youtube page afterwards) as we’ll explain everything above a bit more in depth. Until then though I invite you to explore the new builder — it’s worth a look. The tips for this month will be all based off of the new Process Builder of Salesforce that adds a whole new element to workflow in Salesforce. Before you were limited to alerts, updates and emails with workflow, but with the Process Builder we can now create new child records, other objects and other tasks much more easily in a much more visual designer. The Process Builder can combine multiple workflows into single process and can have chain of criteria (if-then statements). It can associate multiple actions for each criteria. It can have child records updated. The builder can access apex code and simple tasks can be replaced with process builder. Notifications can be applied to both chatter group and email alerts. Criteria is if-else based and will not move to downstream criteria if top criteria is not met (subsequent criteria), however there is a recent change allowing for the process to re-evaluate. The action cannot be re-used (with the exception of email alert) and needs to be redefined for every criteria. Editing a process (after creation) entails cloning and editing, you can not edit a process once it’s saved. Some standard fields (activity due date) for instance are still not able to be updated if they cannot be updated via standard workflow. 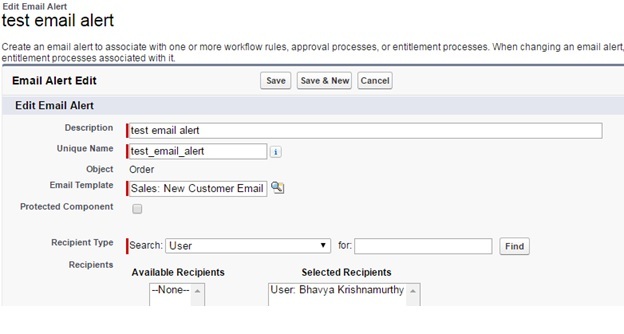 For our examples, we’re going to create an email alert to contrast the method via the new process builder vs. the old standard workflows…..
To show how the process builder works as opposed to the standard workflows, we will create a notification or “email alert”. 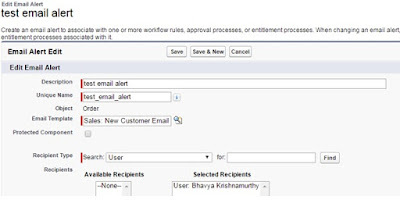 However, unlike the standard workflow, you have to create the email alert before you create the process. 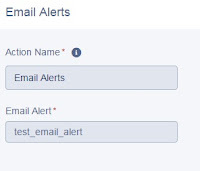 Before, we could create criteria and then create the email alert message. 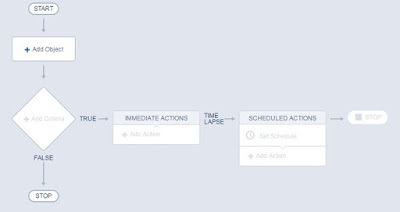 In the new process builder, it’s much easier to add it in before and simply reference it in the process. There is a button however to make a new alert, it just leaves the process builder which can seem a bit odd and disconnected. Go to Setup and search for “Email Alerts” (select it). If you have to pass by the splash page of “what is a workflow”, that’s fine, otherwise you’ll see your list of existing alerts. Click the “New Alert” button at the top to get to the creation screen. 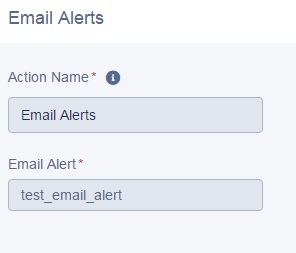 Here you’ll provide a description, the object that the alert performs or is triggered by and the email template that is used (you may have to create that one in the template area as well first). Once created, it will look like this in your list. 1. Open the closed activity that you want to re-open. 4. Hit ‘Enter’ and the activity will automatically update to be open. So cool!